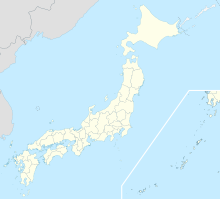 Nyutabaru Air Base (新田原基地, Nyūtabaru Kitch) (ICAO: RJFN) is a military aerodrome of the Japan Air Self-Defense Force. It is located 10.5 NM (19.4 km; 12.1 mi) north of Miyazaki in Miyazaki Prefecture, Japan. Wikimedia Commons has media related to Nyūtabaru Air Base. This Miyazaki Prefecture location article is a stub. You can help Wikipedia by expanding it. This page was last edited on 18 January 2019, at 18:40 (UTC).